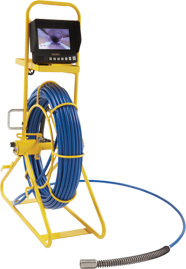 Ratech’s Mini Peek™ small pipe inspection system offers a 5" Black and White monitor, a 1.2" Black and White camera, 100' of durable cable and a 512Hz sonde transmitter all housed in a convenient, light weight, and highly portable reel enclosure or if you prefer it is available with a 5" color LCD monitor. Complementing the camera is 100' of highly durable yet flexible cabling which is housed on a sturdy lightweight reel. At the top of the reel is the 5" monitor that produces a crisp and clear picture which allows the operator to SEE EVERYTHING™. This all-in-one pipe assessment solution is the perfect tool for those just getting into pipe inspection or long time veterans. The Mini Peek™ highly cost effective system is aggressively priced without sacrificing quality.